The UN as has described the Galapagos Islands and the surrounding marine reserve as: “a unique living museum and showcase of evolution”. That pretty much says it all. The Galapagos Islands are truly unique; the wildlife, the plant species as well as the diverse landscapes create a natural haven incomparable to anywhere else. While on a cruise you’ll have the opportunity to experience the best of the islands as well as all the incredible sights on the water. Spend your days relaxing on the vessel in the bliss serenity of the Galapagos, or engage in water activities like snorkelling, swimming and kayaking. In addition, engage in daily wildlife excursions led by naturalist guides, providing specialist knowledge on the incredible flora and fauna of these spectacular islands. The cruise experience itself is luxurious and intimate, with no more than 100 guests on board. Private cabins offer all the amenities you’d find in a hotel room. Depending on which ship you travel on, your accommodation options usually range from standard to luxury. All cruise packages sold by South American Travel Specialists are of the highest standard and offer guests the finest service and amenities. An example of one of many vessels is the M/V Santa Cruz II. 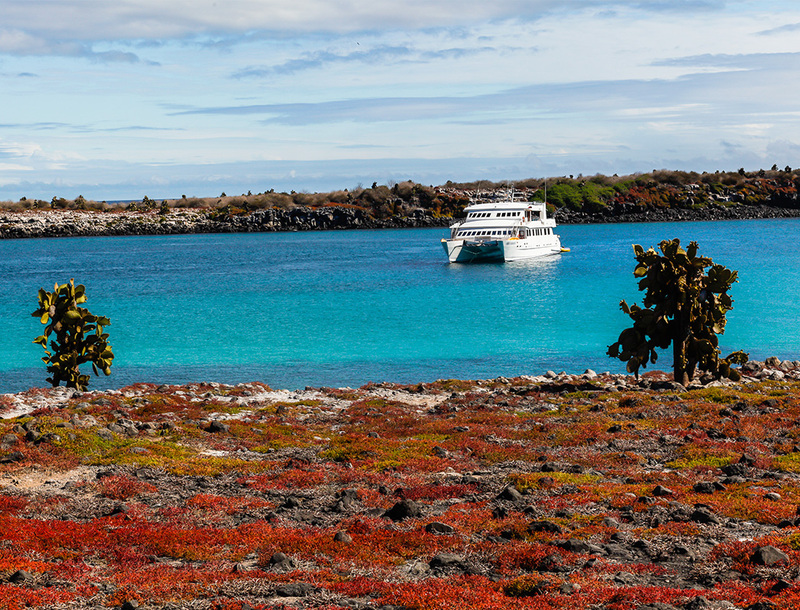 One of the larger vessels that cruises the Galapagos, the Santa Cruz II offers accommodation for up to 90 guests. With 50 cabins, this luxury 70m long, five deck vessel features large social areas inside and out providing guests with everything to make the most of their Galapagos Experience. Cabin options on offer include, single, double and family. And for those looking for something more opulent, there are the Darwin suites which provide guests with enhanced service, as well as special exclusivities such as a take-home Galapagos book and a tablet loan for each cabin. There isn’t much to be done to prepare for a Galapagos cruise. All that you really need to do is ensure you’ve got all the necessary vaccinations to travel. Yellow Fever is the only one required, however be sure to consult your travel doctor before you travel. It’s a good idea to familiarise yourself with some of the flora and fauna you might see in the Galapagos to really enhance your travel experience. On board your cruise, there are usually lectures given by expert naturalists, however it’s always good to have a bit of knowledge on your belt. There isn’t too much to do to prepare for a Galapagos Cruise. And once you’re ready to venture off into one of the most unique places on earth, immerse yourself in incredible wildlife and nature of the Galapagos.